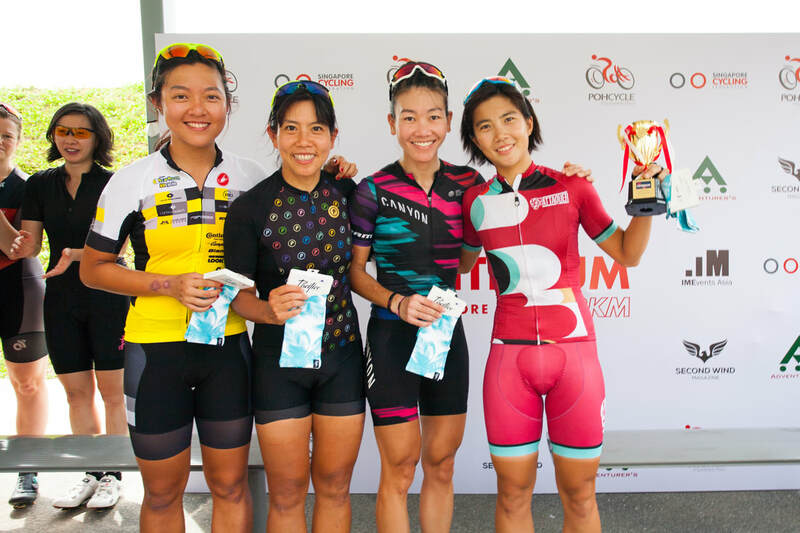 Singapore’s newfound love with crit racing continued yesterday with Team 4T2 taking the honours among the male racers at the IMEvents Asia Criterium at Keat Hong Link, while among the ladies, Team Singapore Cycling Federation (SCF) were the victors. The people at IMEvents Asia are to be congratulated for bringing another competition to the local road racing community and despite a few teething problems, the overall reaction from the racers and the big crowd who gathered to watch the fours hours of action on a glorious Sunday morning was overwhelmingly positive. That action started at 7am with the first of three heats in the Men’s Open competition. The format saw teams of four race 10 laps around a 1.2km circuit, with the fastest 10 teams across all three heats advancing to the final. The combined times of all four members of each team would determine the placings. The race attracted most of Singapore’s active cycling clubs and teams, including quartets from the SCF, Team Integrated Riding, Geylang Cycling Team, 4T2, the Specialized Mavericks, MatadorRacing, Allied World Champion System, TWC Racing, Roadbrothers, New Moon KhCycle, Team Cycledelic, Team 30Forty, the Cranks, CycleTrainingAsia, Poh Cycles, CCK Cyclists, Swiss Club Riders and Giyon, with many of the clubs entering multiple squads. ​The course was perfect for a crit. Roughly oval shaped, it had three rounded corners that meant the riders at the front could pedal right through while hardly touching the brakes, while a little hill at the far end of the circuit meant the racers had to churn out a few extra watts each time around. A grassy slope behind the start/finish line rewarded those spectators eager enough to scramble up it a view of much of the circuit. But with the course so short and the speeds so high, the ground level start/finish straight itself proved the perfect place for most of the crowd. All three Men’s Open heats were fast and furious affairs, full of attacks, chase downs, counter attacks, riders being unceremoniously spat out the back and of course crashes. Heat 1 had a big melee halfway through its 10 laps that took out a considerable number of riders. Some remounted and were able to finish the race and get a finishing time for their respective teams, albeit way behind the peloton, while others were forced out of the race due to injury or damaged bikes. With the event rules making no allowance for changing wheels or bikes (common elements in most criteriums), those riders with mechanical problems were automatically given a DNF. Similarly, there was no allowance for a lap out, meaning even those with mechanical problems who managed to fix their bikes before the peloton came round for the next lap, were a lap down when they rejoined. 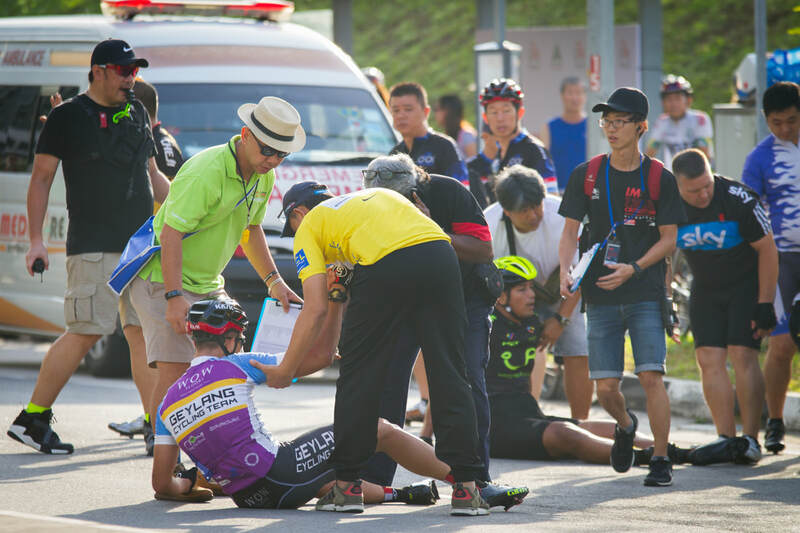 Bike racers accept crashes as part and parcel of the game, but in a team event like the IMEvents Asia Crit, it seems a bit unfair for a whole team to lose out because of one individual’s misfortune. The organisers could, perhaps should, have foreseen this problem, and made the qualifying a “best three riders out of four” format; we even suggested this in our race preview on Friday. Heats 2 and 3 also contained some thrills and spills, and with each field fractured by the breakneck speeds and the fact that many clubs entered multiple teams, it was difficult to ascertain at the conclusion of the heats which 10 teams had qualified for the final. ​While the organisers worked on that, there were two more races on the card before the men’s final; first the Women’s Open and then the Juniors. The Women’s race was also a team event, but was a straight final as it only attracted five teams of four. 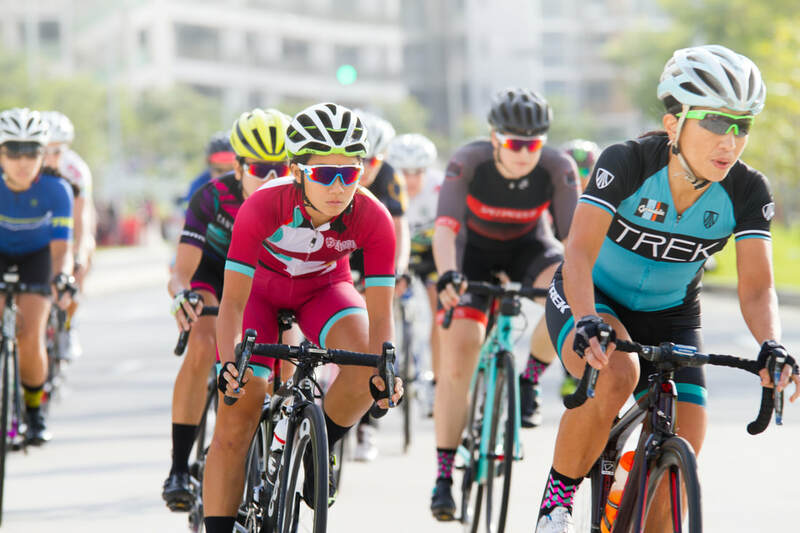 We say “only”, but having 20 women lined up at a criterium (plus three more talented girls in the Juniors race) in Singapore is encouraging; in comparison, the women’s race in the URA Share the Road crit last month featured just 10 riders. The Team SCF squad was an overwhelming favourite to win the race, which also included two teams from Anza Cycling, a quartet from TWC Racing and a Team Cycledelic/Specialized Mavericks combo. The SCF team was led by long-time national rider Serene Lee, who was very active at the head of the field. Several times she opened up a big gap, but the chasers, led by the experienced Cycledelic/Mavericks duo of Christina Liew and Lizzie Hodges didn’t give up and pulled her in each time. ​Lee, though, showed her experience and strength by making one last attacking the final lap; she made it stick and crossed the line well clear of the rest. Andrea Ferschl (Anza) and Hodges were second and third over the line respectively, but with all three of Lee’s SCF teammates also in the lead chasing bunch and receiving the same time, Lee’s gap was the determining factor in handing the SCF squad the win. Lee confirmed post race that the SCF tactic had been to get her clear of the field, knowing that any time gap she managed probably would clinch the title for the SCF. Cycledelic/Mavericks were the runners up, with Anza Cycling 2 in third place. Interestingly, the published results listed Liew of Cycledelic as second over the line, with the real runner up Ferschl listed as eighth, casting doubts on the reliability of the timing system. While Lee’s big gap made it a moot point in the team-based format, the addition of a photo-finish backup is something IMEvents Asia might consider for their next race. 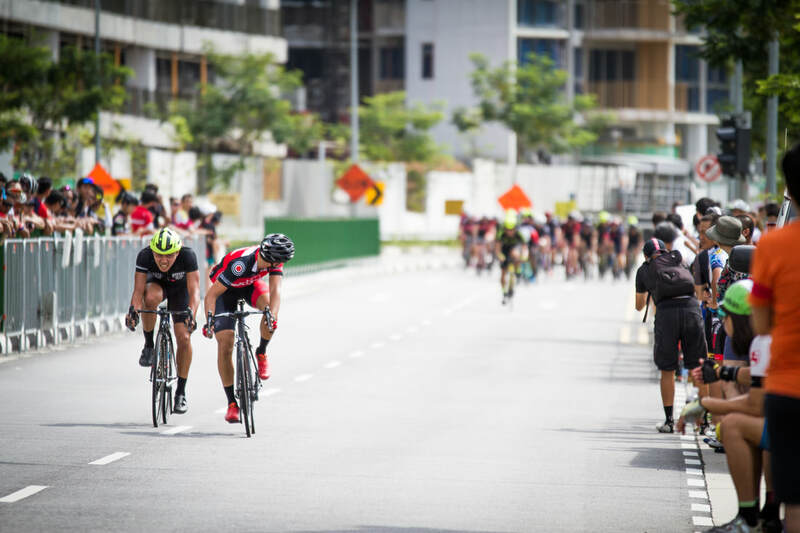 The Juniors race, an individual contest, was next up and once again Singapore’s talented band of young riders put on a great show for the assembled crowd of adult racers and supporters. The teenagers are fast and fearless and the contest was peppered with attacks. The speed saw the 24-strong bunch lose almost half its girth by the halfway mark, but impressively, all three girls – Ashley Jenna Lui and the Middleditch sisters Emma and Louisa, were still in the peloton. The bunch was more strung out as the racers passed the line for the bell lap, and the sprint was contested by a smaller group. Prevailing was Moh Jie Yu, closely followed by Jared Wong and Abu Hudzaifah bin Masnawi. Lui finished at the back of the front bunch to take the girls title, making it two for two in 2017 following her win in the Women’s Open race at the URA Crit. Emma Middleditch was second with Louisa Middleditch third. ​The day’s action culminated with the Men’s final, although there was a considerable delay due to at least one protest by one of the clubs after the list of finalists was published. The problems appeared to lie again with the timing system and also with some lapped riders being given a time for nine laps rather than 10. The protest was upheld and the revised list saw 4T2 A, 4T2 B, Matadors A, Matadors B, Team SCF, TWC Racing A, TWC Racing B, Integrated Riding A, Integrated Riding C and Allied World Champion System listed, although the last two named teams didn’t appear on the start line. Unlike in the heats, there was no neutral lap in the final and two well-known riders, Gabriel Tan (SCF) and Kelvin Khoo (Matadors A), attacked from the gun. They opened up a gap of eight seconds after the first lap and give or take a second or two managed to maintain that lead lap after lap. As the duo crossed the start/finish line after eight laps, though, Muhammad Irsyad Marican (SCF) could be seen trying to bridge from the bunch, with a few others in pursuit. As the bell sounded for the 10th and final lap, Irsyad had joined Tan and Khoo, but with the gap to the chasing bunch now just five seconds, it was going to be touch and go as to whether the long-time leaders and their new ally would hold on. Alas, their bold effort was in vain, as they were swept up heading into the final corner. The catch galvanised the bunch and a furious battle for the glory of being the first individual over the line ensued. To this reporter’s eye and to just about everybody else present, that honour went to Lukmanul Hakim bin Othman of TWC, with Yi Peng Teoh (SCF) in second and Firoz Loh (TWC) in third. ​With the rest of the field tightly bunched it was impossible to tell at that stage which team had prevailed. The final result was announced “live” during the prize-giving ceremony itself, and after Matadors and SCF were revealed as third and second respectively, the crowd was hushed for the big reveal. That honour went to 4T2 B, and was a reward for teamwork and preparation; large contingents of 4T2 riders were seen practicing on the course in the weeks leading up to the race. “It was good, pretty solid. Everyone stuck together for pretty much the whole 10 laps and we came through in the end. It wasn’t about the (individual) win, it was about getting the whole team up there,” 4T2 B spokesman David Cox said post-race. Obviously in good spirits after receiving the trophy, the winners even indulged in a bit of banter at the expense of their vanquished teammates. Interestingly, like for the Women’s race, the published results showed some anomalies. Cox was listed as first over the line, Teoh fourth and the “winner” Lukmanul back in eighth. The timing system definitely needs to be looked at. It’s to be hoped that it didn’t skew the final results as ratified by the team of SCF commissaries. ​IMEvents Asia founder Bryan Chia seemed generally happy with how the morning unfolded, although he acknowledged that there had been a few problems. “I would say there was many things that we can learn from today, and the next one we’ll do even better. We’ll make improvements and do our best for the community,” said Chia. The fact that the IMEvents Asia boss is already talking about the next race is encouraging as the road-racing scene has a definite momentum attached to it at the moment. Hats off to IMEvents Asia. Yesterday’s race was their first and so despite the teething problems they should be congratulated for securing the road closure and giving the community another chance to race. 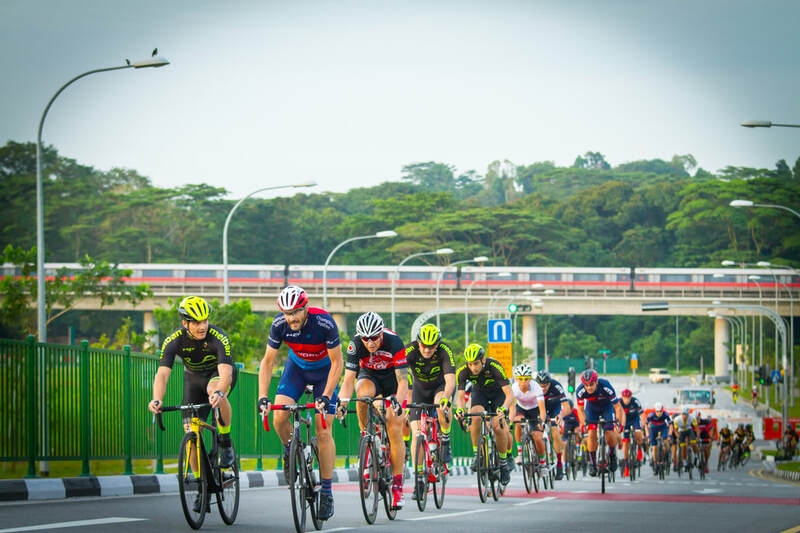 The Singapore crit craze continues with the second edition of the URA Share the Road Criterium due to take place in the Singapore CBD on February 26 as part of the monthly Car Free Sunday initiative. 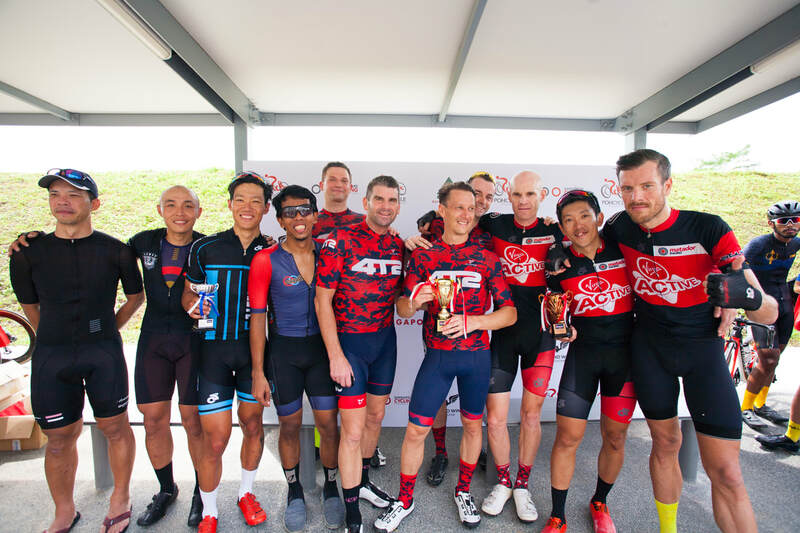 Time limitations mean there will only be two races, and organisers Cycosports are giving the Masters and Super Masters their turn after Men’s Open and Women/Youths had the course last month. Go to ww.cycosports.com for details and to sign up.